discovering heaps more about “dirt” (mainly, but not only, soil). Admission to the event is free, thanks to Central Coast Council, Bendigo Bank, SESL Australia, Viva Living Homes and the Narara Eco Living Network. Soil is the miraculous carpet of life that covers much of our planet- and yet we often treat it like “dirt”! 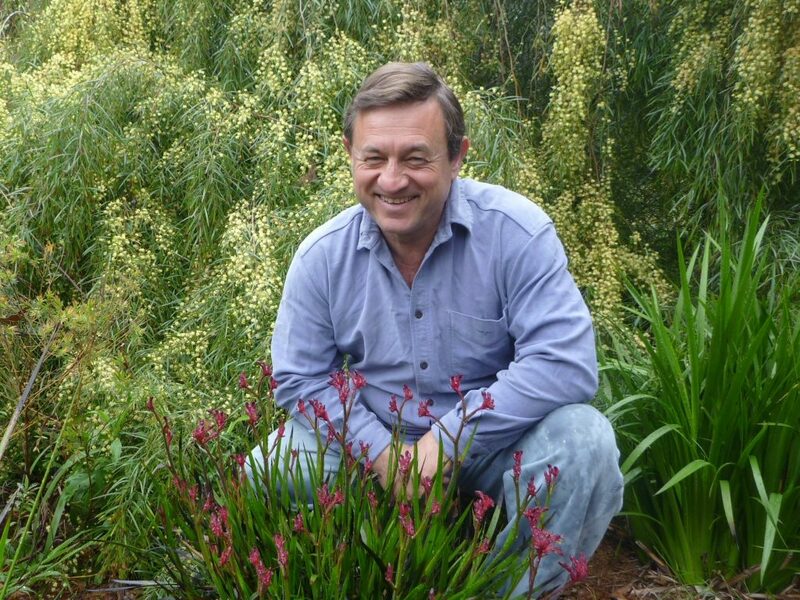 Led by ABC TV Gardening Australia personalities Angus Stewart and Tino Carnevale, a group of soil experts and enthusiasts will talk, and answer all your questions, about soil. There will also be practical demonstrations and chances for adults and children to get their hands dirty! Date: Saturday May 11 2019. 9.30 am to 1 pm: Narara Valley High School, Fountains and Pandala Roads, Narara, NSW 2250. 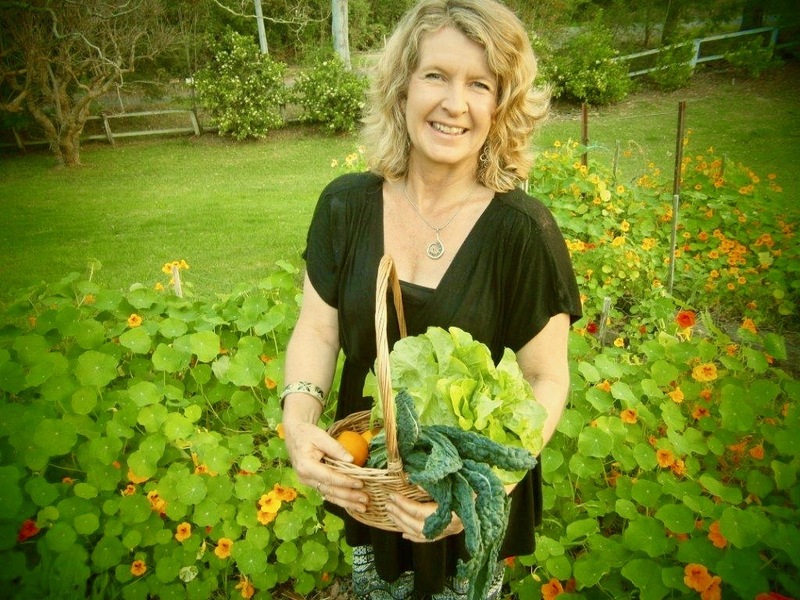 Narara Ecovillage, 25 Research Road, Narara, NSW 2250. Things you can do on Saturday May 11 2019. In the morning (9.30 a.m. to 1 p.m.) at the Narara Valley High School, hear inspiring talks and join panel discussions with Tino Carnevale, Angus Stewart, and people passionate about Permaculture, Biodynamics, safe soils and Regenerative Agriculture, meet exhibitors over lunch and visit the school farm. In the afternoon (1-4 p.m.)at the Narara Ecovillage (just up the road!) hear talks about soil science, composting and health; join a Darkinjung smoking ceremony, go on tours of the ecovillage property, visit a permaculture garden, learn about Central Coast soils, join in kids activities, see steam weeding in action, and see houses being built with materials from the earth – strawbale and rammed earth. There will be a special session for students and potential students on careers related to soil for secondary and tertiary students from 9 to 9.45 am on Saturday at the Narara Valley High School. Entry is free and you do not need to book to come. and Get in the mood by enjoying the Soil Song by Jeremy Newton-John here! 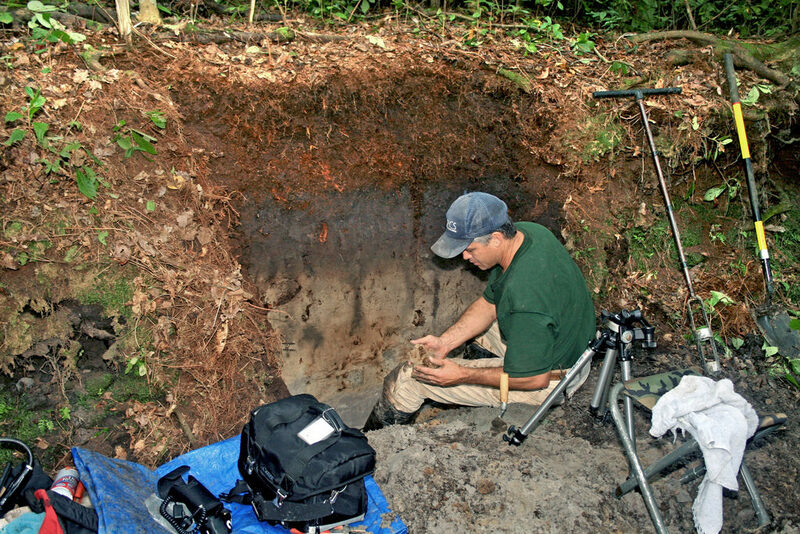 Soil Celebration and Discovery Day Announced. 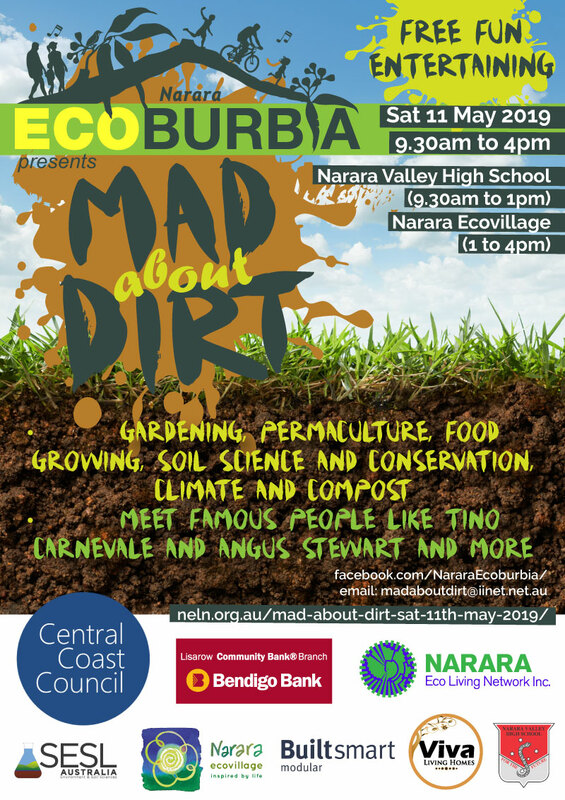 The Narara Eco Living Network has announced a new event, “Mad About Dirt”, to be held on May 11 this year. Co-organiser Joan Cassels said that it was a “child” of the successful Narara Ecoburbia festival that ran from 3 years from 2014 to 2016. It will be a smaller and more focused event than the full festival. Joan said: “ ‘Mad About Dirt’ will be day dedicated to soil, gardening, growing food, permaculture and soil conservation. Keynote speakers include Tino Carnevale and Angus Stewart from ABC TV’s Gardening Australia, Kerrie Anderson form Permaculture Central Coast, Peter Rutherford from Kimbriki Environmental Enterprises, Simon Leake from the Sydney Soil Laboratory and Consultancy, Prof. Mark Taylor of Macquarie University and permaculture and other experts”. “The latest estimates are that up to 2/3 of the world’s soils are being degraded, at a time when the world population and consumption habits is growing. The good thing is that everyone can do something about this in their own back yard. It’s good for you, and you can eat the results! Our great speakers will be sharing why they are passionate about soil, and what you can do”. a tree-hugging, plant-loving, dirt worshipper! and you want to learn more and to meet fellow soil, gardening and permaculture lovers. The current program is attached here. Exhibitors at Mad About Dirt at the Narara Valley High School, 9.30 am to 1 pm. MacQuarie University. VegeSafe and DustSafe programs. Display of in-situ portable X-Ray Fluorescence Spectrometry used by the Macquarie University VegeSafe citizen science program. They will also collect soil samples from attendees, run demonstrations, and discuss other relevant citizen science initiatives. Participants need to bring 1 completed, printed and signed consent form, and 5 soil samples labelled in individual zip-lock bags (there will be spare consent forms and some bags for those who forget). They run off generous donations which cover the cost associated with testing, usually $20 for 5 samples. Go to their ‘how to participate’ page (https://research.science.mq.edu.au/vegesafe/how-to-participate/) which summarises everything including consent form, how to collect your sample, and how to donate. They will also be promoting their household dust analysis program (www.360dustanalysis.com / Facebook: MQDustSafe). Receiving paired VegeSafe and DustSafe samples greatly helps their research as they can compare indoor and outdoor data. If you have completed the above steps all you will need to do is simply drop your samples off. SKN will have examples of different soils from NSW, a local soil profile, simple soil tests, soil sampling equipment, a laptop with SKN videos, and an earthworm experiment. Paul Harvey owns Environmental Science Solutions and his passion is in environmental contaminants / pollutants. He has published widely on this topic. His business, ESS, helps to spread knowledge about potential pollutants in our ‘dirty’ world. ESS offer talks, public presentations and interactive trade stalls. For Mad About Dirt it may be suitable to explore soil pollutants through some of our hands-on activities like ‘plastic in our soil’ where participants can look at fine fragments of plastic pollution in soil under the microscope. Grace Springs Farm, Kulnura NSW. “Soil is at the core of everything we do here on the farm. Our every decision is about improving soils, to be able to grow more pasture to feed more animals & produce nutrient dense food for our community. We are always aiming to increase the water holding capacity of our soil & to increase the biological & fungal activity in our soils. Healthy soils = healthy pastures = healthy animals = healthy people”. The WaterUps from Down Under® water wicking cell is an Australian designed and manufactured product that can be used in a wide variety of watering situations. The wicking cells are modular in nature to allow them to be custom fitted to the shape and size of any growing environment large or small. If need be, they can also be cut or shaped to allow you them work in all manner of growing containers, gardens or landscape designs. SESL: Sydney Environmental Science Laboratory. SESL Australia has evolved over 30 years and is now one of Australia’s leading environmental, soil, water and plant science laboratory and consultancy service. Established in Sydney in 1984 by Simon Leake, SESL has a network of offices across Australia including NSW, VIC, QLD and the ACT to provide their clients with consistent quality and local knowledge. The member –owned Narara Ecovillage Co-operative is creating an ecovillage of over 100 homes to pioneer and demonstrate more sustainable ways of living. Note : currently 2 exhibitor stalls in the High School Main Hall remain available. Email the contact address below as soon as possible if you would to like to apply for one of the them. take a train to Narara rail station, then take a 25 minute walk or 5 minute bicycle ride. You are welcome to bring your own picnic. There will be coffee carts at both venues and a sausage sizzle at the school. We love people who bring their own water bottle, cup and plate. More details soon. Builtsmart Modular (scholarship donation, see separate announcement). For regular updates, see Facebook https://www.facebook.com/NararaEcoburbia/. Contact: email madaboutdirt@iinet.net.au. Phone 0400 601 668. News : Garden design scholarship announced. As part of the Mad About Dirt event, Builtsmart Modular Homes of Lisarow have just announced a generous $8,000 scholarship for year 11 and 12 students of Narara Valley High School and Lisarow High School. The scholarship will be awarded to the best design for a modular garden that can accompany Builtsmart’s modular homes. The scholarship will be managed Builtsmart Modular General Manager Sean O’Hara and Narara Valley High School Deputy Principal Kerrie O’Heir. The project was dreamed up by Joan Cassels, co-coordinator of the Mad About Dirt event. Sean O’Hara said that Builtsmart wanted to provide opportunities for local high school students to gain skills. “ We produce environmentally friendly modular homes, now we would like to encourage local young people to design environmentally friendly gardens to go with them. We are looking for designs that can make use of Builtsmart’s technical capacities and any by-products of our manufacturing processes. The garden beds should be suitable for delivery and attachment to Builtsmart Modular homes for decks, window boxes, and for under and along side the houses, including vertical gardens”. Students who wish to enter the competition will have a special opportunity to get expert advice from television personalities Angus Stewart and Tino Carnevale at the Mad About Dirt event at the Narara Valley High School on Saturday May 11 at 9 a.m.
Sean O’Hara said that Builtsmart wanted to provide opportunities for local high school students to gain skills. “ We produce environmentally friendly modular homes, now we would like to encourage local young people to design environmentally friendly gardens to go with them. We are looking for original ideas, and designs that can make use of Builtsmart’s technical capacities and any by-products of our manufacturing processes. The garden beds should be suitable for delivery and attachment to Builtsmart Modular homes for decks, window boxes, and for under and along side the houses, including vertical gardens. Ms. Kerrie O’Heir of Narara Valley High school said she looked forward to seeing the students work in pairs to produce the designs. “The exercise complements the curricula for our horticulture and engineering students by giving them a real world challenge”. Dig Deeper with Angus and Tino: the perfect Mother’s Day gift. Sunday May 12, 11 am to 1 pm, at th Narara Ecovillage Visitor Centre. “Dig Deeper with Angus and Tino” is an exclusive opportunity to spend time with these talented and knowledgeable gardeners. 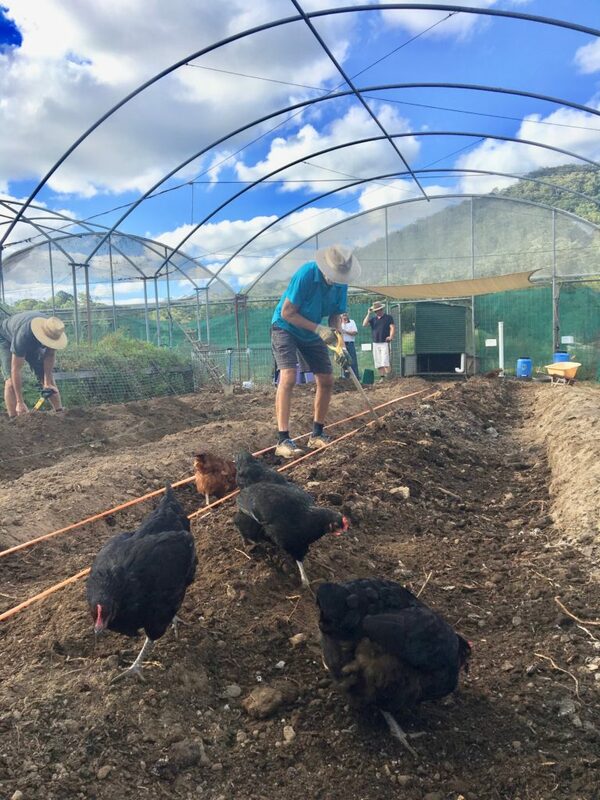 “Dig Deeper” will take place on Sunday May 12 in the Visitor Centre of the Narara Ecovillage, 25 Research Road, Narara, NSW 2250, from 11 am to 1 pm. Tickets are $25, or $22.50 for NELN members. You can now book your place for Dig Deeper at: https://dig-deeper-with-angus-tino.lilregie.com/booking/attendees/new . Once you have registered with this site, they will send you an invoice for payment. BYO picnic lunch for afterwards, or book your local restaurant table for 1.30 pm and avoid the rush! 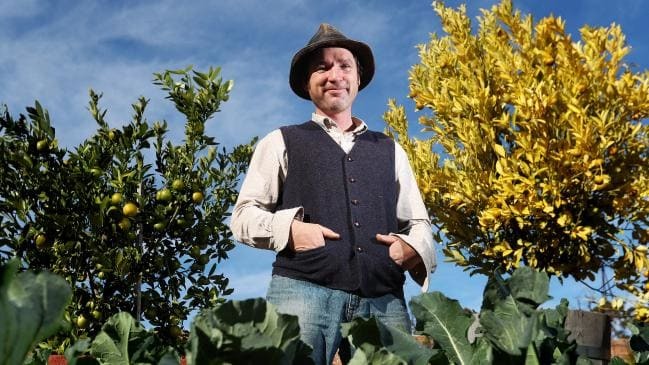 For more on Angus, former Central Coast resident and now climate refugee in Tasmania, go to https://www.gardeningwithangus.com.au. (NB Angus’s first job was at DPI Narara!). Angus will be available to sign his books like Grow Your Own: How to be an Urban Farmer(with Simon Leake), and The Australian Native Garden, A Practical Guide(with A.B. Bishop).